Apparently, the first of May in Colorado means six inches of snow! One of their easy sample fun garden projects is the Toyrarium. Using their model for inspiration, I decided to design a new home for my dear old cactus. 3.) Rocks I already had the cactus at home and a glass zebra figurine for decorating my terrarium with. I went out looking for a simple fish-bowl, but I found a 1-gallon Ball Mason Jar at the hardware store, which I thought would work really nicely. My fiance and I are big fans of simple Mason Jars. We’ve even replaced most of our drinking glasses with them. I didn’t want to shock the cactus by bringing it out in the snow to transfer it, so I set up shop on the kitchen floor in my apartment. I removed the top off of the jar and filled the bottom with about 2.5 inches worth of smooth rocks. Then I used a large spoon to carefully scoop about 2-3 inches of potting soil on top of the rocks. In the meantime, about half of the bag of dirt ended up on my kitchen floor. 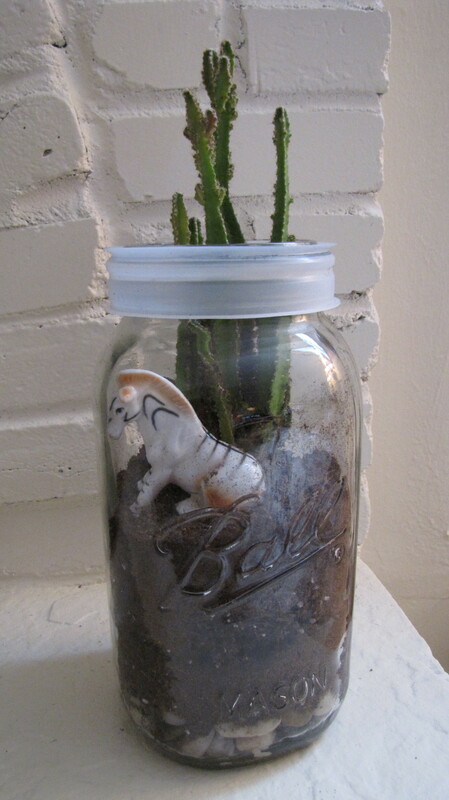 I then carefully removed the cactus and its roots from its old pot and placed it in the Mason Jar (getting poked a few times in the process). I scooped more potting soil into the jar until dirt surrounded the cactus roots up to the base of the plant, thus stabilizing the cactus. I poked myself on the cactus’s spines again while nestling the small glass zebra next to the plant on top of the soil (note to self: get some gardening gloves). And as simple as that, I have a cute and creative new terrarium for my favorite cactus! I think the shape of the jar compliments the shape of the plant nicely. I placed it on a table next to my sunniest window. I’m hoping that the cactus will thrive a little more now that it has some nice new soil. 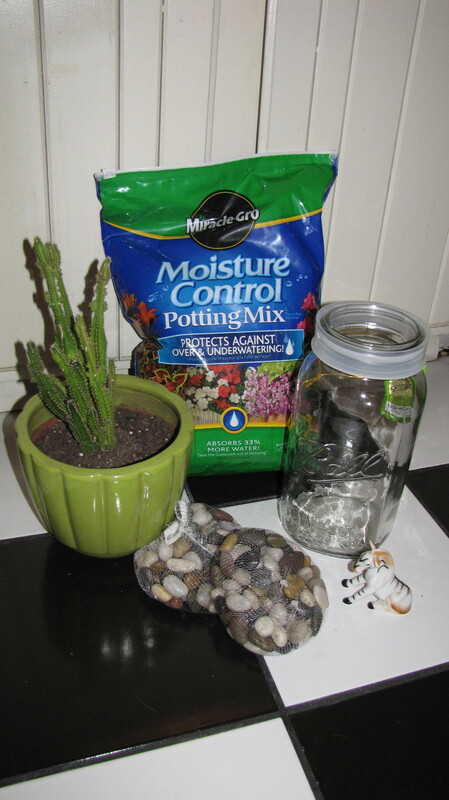 I don’t have the greenest of thumbs, so I’m optimistic that the Moisture Control Potting Mix will help compensate for an over-watering or under-watering that I’m sure to subject my poor cactus to. If you decide to make your own Mason Jar terrarium, or to try any of the fun and easy “Gro Project” guided gardening projects, please comment below and tell us how they turn out! You can see what other gardeners are doing by following the Miracle-Gro pinterest page.